James Vickers once believed honor and family duty to be his life’s work. Now he knows better–and he’s appointed himself as silent witness to his father’s sins. His greatest goal is to act as the continuously pricking thorn in his lordship’s side–and scandal is his greatest weapon. Propriety is Miss Adelaide’s Stockton’s most important asset. She must be all that is prim and proper if she’s to live down her parents’ misdeeds and have any hope of catching a husband. She must avoid scoundrels like Vickers at all costs. Yet fate has thrown them together–and given each the key to the other’s ambition. A bargain is struck . 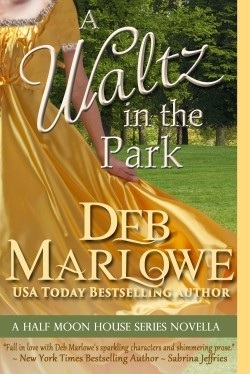 . . but together they find that gaining what one desires most is far more difficult than a waltz in the park. ​The girl was there. She stood in profile, her curves clearly outlined against the bright lights of the party, her aristocratic profile only visible as an elegant shadow against the glow. It was enough to settle a weight upon Vickers’ chest, and to set his heart beating, as if it meant to throw the heavy burden off. He moved in, staying in the shadows and stepping close to the broad, rough-hewn stone pillar supporting the corner of the terrace. She started and then laughed a little. “A partnership,” she responded instantly. “That’s what I thought,” she said smugly. He wondered what that looked like on her angelic face. “It would be foolish of me to tell you, wouldn’t it? He was glad she was quick enough to realize it–and amused that she thought he wouldn’t be capable of finding it out. She kept silent a moment and he realized she was making sure they were alone. Starred Review at Library Journal!